Church restored in 1874 incorporating Saxon or early Norman window above Norman north arcade. South arcade built in c.1300 but removed, probably in 1766. West tower rebuilt after collapse. C15th tiles. Monument of Henry Fawnt (d.1665). Church. Fabric dates back in part to C10 or C11, though most is early C14 and it was extensively restored and altered in 1874. Granite rubble with limestone dressings and Swithland slate roofs. West tower, nave with north aisle and chancel in one. Tower is wider than it is long, since part of it collapsed and was rebuilt more narrowly. Angle buttressed, plain chamfered bell chamber lights with wood tracery. Embattled parapet with simple finials. South wall largely of 1874, infilling a former south arcade of the C14. The windows are in a Perpendicular style. South door and porch also Victorian. 2 profiles of early roof structures visible against tower wall. Chancel has 3-light window, Victorian in Decorated style. Renewed 3-light Perpendicular window in north wall blocked square-headed opening and doorway with hollow and roll-moulded architrave. Inside, the west tower arch is early C13: narrow and double chamfered, the inner thick chamfer is carried on heavy corbel heads. Blocked south arcade of three bays is late C13 or early C14, double chamfered with stops and octagonal shafts and abaci. The north arcade however is C12: low round shafts have projecting abaci and stepped segmental arches. The eastern bay cuts the remains of an earlier round-headed window with voussoirs, the sole visible evidence for the early dating of the church. Nave roof is largely Victorian but using medieval tie-beams. Easter-most bay alongside the chancel is a later construction, probably C14, with double chamfered arch and semi-octagonal respond. Possible C17 communion table and C18 altar rails. Various C15 embossed patterned tiles in the north aisle. Glass in the style of Kempe in the east window, 1896 depicting Saints Bartholomew and Philip with Christ. Monuments in the north aisle: on the east wall a memorial stone in a broken pediment, black, yellow and white marble with urn commemorates Charles Skrymsher Boothby d.1774, the panegyric dedicated by his widow Anne, who is also interred below. Against the north wall, Henry Fawnt Esq., and Elizabeth who was his third wife. The two recumbent effigies lie on a tomb chest beneath an aedicule where red-faced putti pull back curtains. The effigies are loosely shrouded. The carving is crude but exuberant and painted. Inscription behind the figures records the children of all Henry's marriages, with their death, marriages and issue. 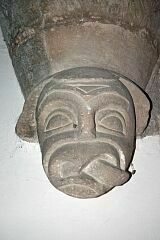 Font is probably C12 or C13. Round basin on central shaft with four squared outer legs. 2/37 & 4/37. Dates back in part to C10/C11. 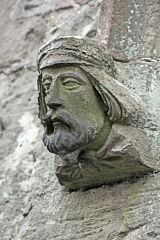 Project Gargoyle survey work in April 2011 recorded two heads on the corbels on the tower arch (one an unusually stylised tongue poker). These may be early 14th century. Externally, there are two heads on the label stops of the east window. 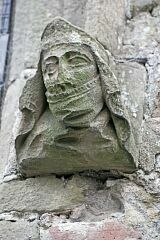 One is a 'conventional' (though well-carved) bearded man; the other is an unusual depiction of a human head with the mouth covered with a scarf (the headgear suggests this is a woman). These are presumably from the 1874 restoration. <1> Pevsner N, 1984, The Buildings of England Leicestershire and Rutland, p153 (Bibliographic reference). SLE4. "The W tower is of an odd shape: its W half collapsed and was built up narrower than it had been. The exterior is essentially the work of the restorers of 1874, except that the N doorway is possibly quite old. S arcade blocked and S aisle lacking (faculty for the removal of the aisle and chancel 1766). The details of the arcade can be recognised inside. As one enters, one realises that this is one of the more antique of Leicestershire churches. N arcade Norman, but exposed above one arch part of a Saxon or, at the latest, early Norman window. The arcade is of three bays with circular piers and square abaci. Low capitals, very sparingly moulded. Two bays of one-step arches, the third two-stepped. 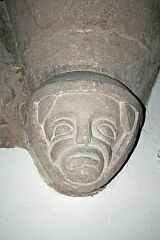 The fourth bay is different and belongs to the date of the S arcade, that is the usual Leicestershire building period of c.1300; octagonal piers, double-chamfered arches, a little nailhead in one respond. - TILES. A few of the C15. - COMMUNION RAIL. C17. - FONT. Plain, circular, still on its four original legs and central shaft. - MONUMENT. Henry Fawnt d.1665. Bad but engaging. Recumbent effigies. Two angels pull away curtains from the back wall with inscription, and there are two cherubs, one with a cannon ball by his feet, the other carrying one on his shoulder." <1> Bibliographic reference: Pevsner N. 1984. The Buildings of England Leicestershire and Rutland. p153.